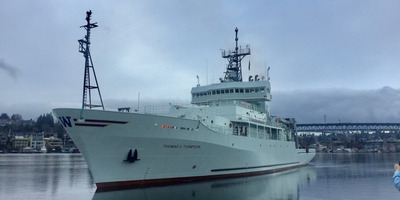 University of Washington via the Office of Naval ResearchThe newly refurbished RV Thomas G. Thompson on its way back to its home dock at the University of Washington’s School of Oceanography. Beijing expressed “solemn concerns” Wednesday after a US Navy vessel stopped in Taiwan, brushing up against China’s red line. Taiwan’s defence ministry stated emphatically that the visit was “unrelated to military activity,” amid speculation that this might be a precursor to plans for a US Navy show of force near Taiwan later this month. The Thomas G. Thompson, a research vessel, has visited before, but this visit comes on the heels of a major showdown in the South China Sea. Toward the end of September, a Chinese destroyer nearly collided with a US Navy warship during a tense standoff following a close pass of Chinese-occupied islands. A US Navy research vessel docked in Taiwan on Monday, sparking concern in Beijing at a time of heightened tension between the United States and China. China is “expressing our solemn concerns to the US side,” Lu Kang, a spokesperson for the Chinese Ministry of Foreign Affairs, said Wednesday, adding that Beijing “opposes all kinds of military contacts between the US and Taiwan.” The US should immediately “stop all forms of official exchanges and military interactions with Taiwan and handle the Taiwan-related issues with caution,” he warned. Ma Xiaoguang, a spokesperson for China’s Taiwan Affairs Office of the State Council, called on the parties involved to be cautious “in deed and avoid undermining peace and stability across the Taiwan Strait,” according to China’s Xinhua news agency. “The Taiwan issue bears on China’s sovereignty, territorial integrity and core interests, and we have firmly resolved to safeguard state sovereignty and territorial integrity,” Ma explained. The US Navy research vessel is carrying about 30 scientists from Taiwan, the Philippines, and the US, the Liberty Times Net reported, adding that the ship is set to conduct oceanographic research in the South China Sea. The presence of a US naval vessel, even one engaging in non-military activities, at a port in Taiwan makes Beijing very uncomfortable. “The day that a U.S. Navy vessel arrives in Kaohsiung is the day that our People’s Liberation Army unites Taiwan with military force,” Li Kexin, the minister at the Chinese Embassy in Washington, said last year. The latest visit has not crossed that red line, which would activate China’s Anti-Secession Law, which permits the use of force to defend Chinese territorial integrity. The visit comes amid heated disputes over trade, sanctions, Chinese territorial claims to the South China Sea, and arms sales to Taiwan. Beijing’s concern over the arrival of the Thomas G. Thompson in Taiwan comes on the heels of another incident with a US warship. After a recent US Navy freedom-of-navigation operation near the contested Spratly Islands, during which a US warship approached Chinese-occupied territories, a Chinese destroyer challenged the US vessel to a showdown, nearly colliding with the American ship in the process.